These All Bran muffin recipes are so incredibly quick and easy to make and taste absolutely delicious. 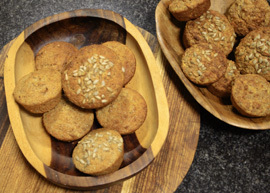 If you are looking for an easy, tasty and healthy recipe for bran muffins then you need look no further – these are of the best you’ll ever taste. These easy healthy muffin recipes are pretty much flop proof and incredibly versatile, so please feel free to play around by adding different variations such as mashed banana, raisins and dried cranberries. Chopped nuts and seeds will also add a delicious crunch and give an extra health boost too. The use of whole grains ensures that they are high in dietary fiber which is essential for keeping our bowels healthy. 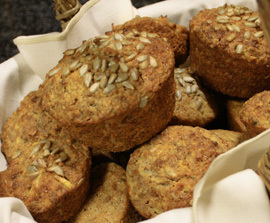 These muffins make a wonderful anytime snack. My children love to eat them just like that, but they also taste great with some honey or peanut butter. Munch on them for a quick and easy breakfast, dress them up for a healthy afternoon tea or pack them in for a yummy school or work lunch. As I said before, these muffins as so easy to make - it’s just a matter of putting all the ingredients together in a bowl and mixing till just combined. It is interesting to note that when making muffins, the less they are stirred the better your results – now that’s a great win-win situation. Theses muffins freeze really well, so a great tip is to make a few batches to freeze. Simply take them out of the freezer and defrost. I pop them into the microwave to defrost and they come out looking and tasting like they’ve been freshly baked. 1. Put all the ingredients together in a bowl and mix together until just combined. 2. Bake @ 400ºF (200ºC) for about 20 minutes or until golden brown and cooked through. 3. If you are making giant muffins, bake them for around 25 minutes until cooked through.